I’d been wanting to do this route since January. Initially I’d planned to do it on my friend Dave’s Elliptigo, but worries about mechanics and the practicality of taking the Elliptigo plus it’s trailer (making the whole set up very long) on a multi-day adventure then trying to get the train back, simply held me back. 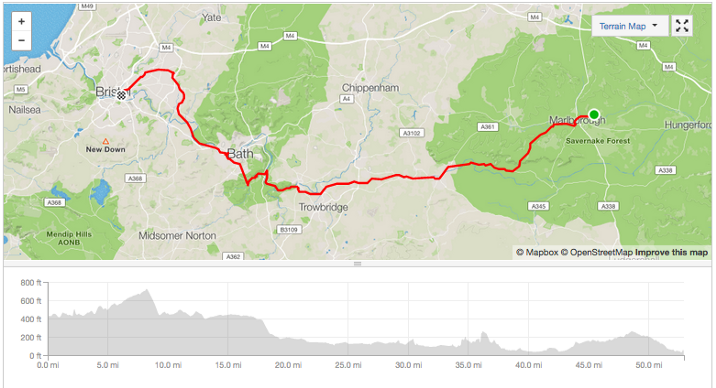 So following my after work ride to Brighton the week before I decided it was time to just get on and do it. I looked at the route and figured out I could get half way, covering around 75 miles on the first day, and then finish off on Day two going via the Two Tunnels near Bath. While I do like camping out, as I was going on my own I was keen to stay with someone on the first night so I contacted some lovely people on WarmShowers.com and found a bed for the night as well as some great conversation discussing all things cycle touring. This time I was going to be staying out over night, and just in case the WarmShowers bed fell through I took my sleeping bag and a bivvy so I could camp in a field if worst came to worst. I also had some more tech with me. Nothing exciting, just charging cables, a tripod for my camera and a battery pack. Plus a change of clothes and a down jacket in case I got rained on and needed to warm up in some dry clothes. All in it meant I needed two panniers, but it was fairly light. I headed straight out my front door for the Thames around 7am. Once I reach the river I followed the Thames Path west until I got to Weybridge, at which point I hit the roads aiming for the southern end of Windsor Great Park. I knew there was a cafe at the entrance as I’d previously cycled through with friends Rod and Chris when we took Dave’s Elliptigo and his Ice Trike for a little spin (Dave has many a wonderful and weird contraption! …He’s currently on a Schiller Bike, which is, of course, a bike you ride on water). Once out the other side of the park I followed the A329 through Bracknell and on to Wokingham for lunch. I’d made some sausage sandwiches at home before I left (3 to be precise, that’s not greedy though right, I’m cycling a long way!). After an hours lunch break I joined the A4, a long straight and fairly wide road all the way to Marlborough. If you’re not a fan of traffic you might want to opt for a different road but I don’t mind it. In actual fact the road was closed at one point, and being the only person able to get through it made for a very quiet section which was nice. Close to Marlborough. Helmet: Lumos. I finished up on that first day covering around 75 miles reaching my hosts at 7:30pm. The next morning I was off again by 7:30am having had a wonderful nights sleep and a great evening of stories from my hosts on how they cycled across the world. You meet some incredible people through WarmShowers. It’s almost always my preference when touring. On day 2 I headed through Devizes and joined up with the canal path which forms National Cycle Route 4 (NCR4) from London to Wales. I’m not usually a fan of canal paths — I’m always scared of falling in and they’re often pretty remote so a lack of cake options, or help should I actually fall in, put me off. But on this occasion it was a nice route. Wide enough to allay my fears in the most part and a few cake options along the way. I followed it all the way to Monkton Combe where the start of Bath’s Two Tunnels begins. Here I met up with my friend Emma who lives in Bath and we had a very leisurely 2 hour lunch in the pub that marks the start of the tunnels. Once we’d caught up and filled our bellies we set off. The first tunnel is the longest out of the two as well as being the longest in the country. With a slight curve it means you can’t see the other end and it’d be pitch black if it weren’t for the lights. They’ve also thrown in some music which makes it less creepy in there. I have to say I prefer cycling in daylight and through green routes, rather than in a tunnel, but it’s nice to have experienced what it’s like. Out the other side and we stopped for a quick bit of Geocaching. I’ve never tired it before and Emma was enthusiastic for me to give it a go. Unfortunately we couldn’t find either of the two hidden gems we were looking for as the clues weren’t very good. I’ll have to have another go another time. We then cycled round into Bath back to the canal so I could rejoin NCR4 and follow it all the way into Bristol, while Emma headed home. This section beyond Bath was particularly flat and almost exclusively off road. It follows an old train line and was familiar ground as I cycled this way last year en route to John O’Groats. If you catch the route on a good day you can even see the old steam train that still runs along the line occasionally. Once on the outskirts of Bristol there’s a brilliant green way for cyclists that takes you right into the city center without the need to touch a road. 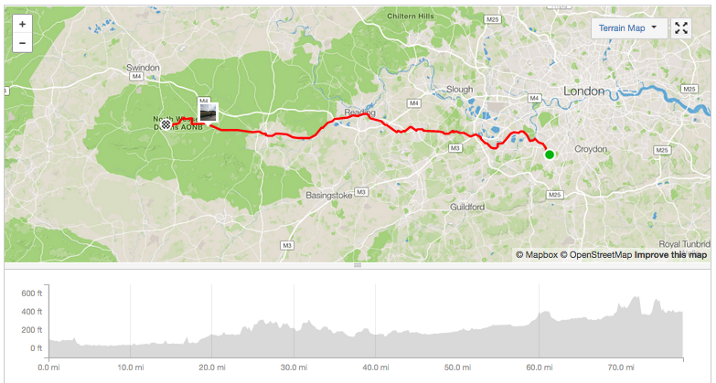 All in a great route, fairly flat all the way from London and some lovely countryside along the way to boot. I’d highly recommend it for a nice weekend getting outside and discovering somewhere new.